The Communist Party of China founded the People's Liberation Army on August 1 during the Nanchang Uprising. The army was called at that time as the Chinese Worker's and Peasant’s Red Army. Another simplified name, Red Army, became widespread. The Central Committee of the Communist Party of China established Red Army Day in 1933. 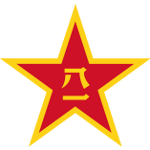 In 1946 the army was renamed to The People's Liberation Army. Army Day in China is a professional holiday for those men, who serve in the People's Liberation Army. This is an official working holiday for everyone, but the servicemen have a shorter working hours. Military parades are sometimes organized to celebrate Army Day (that is also known as Armed Forces Day), but this is not traditional way of celebration of this professional holiday.